Christian Montgomery is burnt out—the family business might be his entire world, but his father’s judgment means Christian never stops working. His only respite is gazing at the beach and the carefree surfers riding the waves…especially the curvy redhead who’s caught his attention. Sophia Bennington has just fled from her small Kansas town to California, where she’s trying her best to embrace her new beginning. Soon Christian and Sophia find one another, and it feels like sanctuary. But when their difficult pasts catch up to them, will they run away from each other? 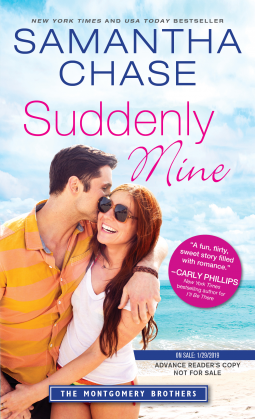 Suddenly Mine by Samantha Chase is another one of those laugh-out-loud romantic stories that grab your full attention. A couple of family relatives get it in their minds to set-up their relative. Dating is something the Montgomery family is good at getting their relatives to do. Sometimes they’re wary of the set-up but more times than not they are completely unaware. I loved how this story played out. At first, I was thinking poor Christian here goes another attempt with his personal love life. And yet, at the same time, I was like yes, finally! This novel, Suddenly Mine, is entertaining. I could not get enough of the characters. From family to friends to the lead protagonists, Samantha Chase caught my heart. I fell hard and fast for Christian and the redhead, Sophia. They both compliment each other in ways that made me swoon. I love that Sophia was a strong female character. With the Montgomery men, they need strong vibrant women to keep them in-line and happy. Sophia and Christian are at first like bait for the sharks until they both discover their undying attraction. If you are looking for heat, passion, humor and an emotionally charged book-then this, is the book to read! I highly recommend this new contemporary romance to all readers.